This may well be the longest it's taken me to post a blog (2 and a half weeks!) and the most boring blog I've written. But I thought I would write. In case you started thinking I died. Since "boring" is the theme, why don't I start with the weather? Today I called up to camp, 2 hours north of here, and it was snowing. It wasn't much warmer here in Saskamatoon. I am sleeping in a tent all weekend, and here's hoping the weather improves. But at least I will be in Alberta. Maybe they're stashing all the warm weather somewhere over there. My family is driving out for our annual Homowebmape gathering (see blog from May last year). It will be different this time, though, because one of us is getting married - Ashlyn Webber. That doesn't usually happen, so it will be fun to participate. How have I been so busy that I haven't blogged, you ask? Well, I work 9 to 5 now. Which is easier than the life of a student in many ways, especially because at 5, you're done. No homework. You can do what you want with the evening. I have mostly read books, watched "Lost" (a very good substitute for "Alias") and gone for coffee. Actually, coffee is a theme for me right now, because that's what I do for a living. I take potential camp staff out for coffee in informal job interviews. Except that I don't like coffee, so I usually purchase a hot non-coffee beverage. I'm not going to lie, it's a pretty sweet job. I do other things too, things that involve sitting at a desk and not doing any exercise to work off all the hot non-coffee beverages. And in the evenings, I sit some more. Good thing I'm going up to camp in a few weeks, where the potential for my body moving around is slightly higher. Otherwise, I'm just enjoying life with the family for a while. I love when we're all around the table for a meal. And I'm looking forward to the road trip this weekend. Next week it will be just us kids, because my parents are going to San Francisco for my dad's Doctor of Ministry convocation. Rachel will take over the role of "mom", because she's feeling domestic lately. I will be the eldest daughter, and I will help out when required, such as in the cooking of butter chicken. 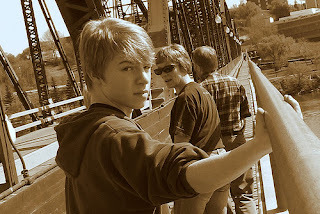 Daniel will mostly sing falsetto for us, because he will soon be auditioning for the role of Jean Valjean in Les Miserables at his school, and the song is very high. Also... I am learning Greek. I have a goal to test out of the first semester of Greek and take semester 2, so I'm trying to do a little bit every day. Danice gave me a textbook and I bought a workbook on Amazon. We'll see if I can keep it up when I'm at camp. "I think this restlessness is probably a good thing, it reminds us that our true home is with God and that our hearts are and will be restless until we find our home in him. How then, to keep the heart soft for that final homecoming when there are so many home-like-comings and home-like-leavings in the meantime? And how do we become more and more integrated rather than more and more dis-integrated in the process? It is easy to have different personas in different places. But perhaps the preparation for our final homecoming is to bring those different personas together into the image-bearers we were created to be." Well, I'm really running out of things to say... I'm sure I'll have more after my tent and wedding escapades this weekend. I promise to write again soon. In the meantime, here are a couple of pictures from a family walk we had by the river. 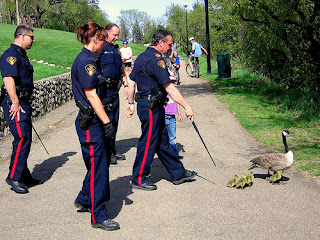 The policemen were herding the geese from the road back to the river. I guess this is what keeps the police busy in Saskatoon - it took four of them, it seems.